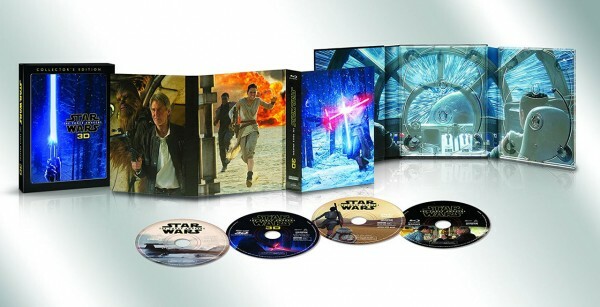 Star Wars: The Force Awakens has been released to a special 3D Collector’s Edition from Buena Vista Home Entertainment. The 4-disc edition features the movie in 3D, which was previously unavailable on Blu-ray Disc, as well as 2D Blu-ray, DVD, and Digital HD copies all packaged in the collectible case seen above. Disney also added plenty of extra bonus material that hasn’t been seen before. New bonus material in the Blu-ray 3D Collector’s Edition includes additional deleted scenes, behind-the-scenes conversations with cast and crew, and revealing, never-before released audio commentary from director J.J. Abrams. The Star Wars: The Force Awakens 3D Collector’s Edition sells for $29.99 from Amazon and Best Buy. What we’re missing, still, is a 4k Ultra HD Blu-ray release of the film. Foley: A Sonic Tale – Foley artists, consisting of old pros and new talent, unite to bring the world of Star Wars: The Force Awakens alive through the matching of sound to action. Sounds of the Resistance – Hear how the epic sound design of Star Wars: The Force Awakens moves the Star Wars legacy forward. The Scavenger and the Stormtrooper: A Conversation with Daisy Ridley and John Boyega –The two new stars share the thrill of working together on the adventure of a lifetime and becoming part of the Star Wars legacy. Inside the Armory – Take a fascinating tour through the design and creation of the weaponry in Star Wars: The Force Awakens. Classic Bonus Features – These offerings from the April release of Star Wars: The Force Awakens include the complete story behind the making of the film, an unforgettable cast table read, insights from legendary composer John Williams, and deleted scenes, as well as features that dig deeper into the creation of new characters such as BB-8, the design of the climactic lightsaber battle between Rey and Kylo Ren, the film’s remarkable digital artistry, and the Star Wars: Force for Change global aid initiative.